Some cats just won’t give peace a chance. There are several reasons that cats might not get along. The most common is under-socialization—a lack of pleasant experiences with other cats early in life. If your cat grew up as the only cat, with little or no contact with other felines, he may react strongly when he’s finally introduced to another cat because he’s afraid of the unknown, he lacks feline social skills, and he dislikes the disruption to his routine and environment. Cats tend to prefer consistency over change. This is especially true if the change involves a newcomer to your cat’s well-established territory. Cats are a territorial species. While some cats overlap their territories a great deal, others prefer to keep a good distance from their neighbors. Two unrelated males or two unrelated females may have a particularly hard time sharing space. Another cause of strife may be a feline personality clash. Cats usually don’t get to pick their housemates, and sometimes we humans just don’t select the right match. In some cases, however, cats get along just fine until something scary or unpleasant (like fireworks or the odor of the veterinary clinic) becomes associated with the other cat. In other cases, relationships change as the cats mature. If one cat reaches the age of one to three years old and then trouble brews, social maturation may be a factor. Any sudden change in your cat’s behavior could be an indication of an underlying medical condition. If you notice any unusual physical or behavioral symptoms, or if your cat stops eating, please see your veterinarian right away. A female cat with a litter of kittens may hiss, growl, chase, swat or try to bite another cat who approaches, even one with whom she was formerly friendly. Maternal aggression usually subsides once the kittens are weaned. It’s a good idea to spay maternally aggressive cats to prevent future litters and future aggression problems. It’s common for kittens and young cats to engage in rough, active play because all feline play consists of mock aggression. Cats stalk, chase, sneak, pounce, swat, kick, scratch, ambush, attack and bite each other—all in good fun. If they’re playing, it’s reciprocal. They change roles frequently. Their ears are typically forward in play, their claws may be out but they don’t cause damage, and their bodies lean forward not back. 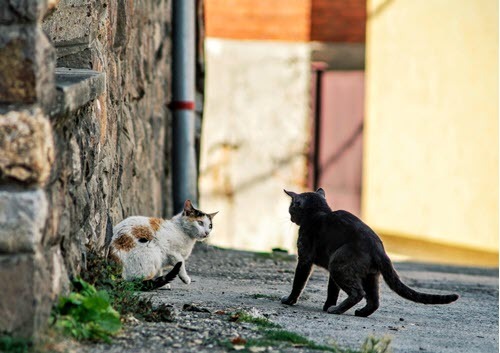 Never let the cats “fight it out.” Cats don’t resolve their issues through fighting, and the fighting usually just gets worse. Interrupt aggression with a loud clap of your hands, spray from a water gun or a burst of compressed air (no noise). Neuter the cats. Intact males are particularly prone to aggressive behavior. Separate their resources. Reduce competition between the cats by providing multiple, identical food bowls, beds and litter boxes in different areas of your house. Provide additional perches. More hiding spots and perches will allow your cats to space themselves out as they prefer. Don’t try to calm or soothe your aggressive cat, just leave her alone and give her space. If you come close, she could turn and redirect her aggression toward you. Reward desired behavior. Praise or toss treats to reward your cats when you see them interacting in a friendly manner. Try pheromones. Feliway™, a product that mimics a natural cat odor (which humans can’t smell), may reduce tensions. Use a diffuser while the aggression issue is being resolved. Separate your cats in different rooms for several days or weeks, with separate beds, bowls and litter boxes. This way they can hear and smell each other, but don’t have to interact. Place the cats’ food bowls on opposite sides of a closed door. This will encourage them to be close together while they’re doing something that makes them feel good. Each day, have the cats switch rooms so that they both experience some variation and get access to each other’s scents. You may need an assistant to do this safely. After several days, if both of your cats appear relaxed, crack the door open one inch. If they remain calm, open the door a bit more, then a bit more. If the cats remain relaxed, they may be ready to be together again. But if they react with any signs of aggressive behavior—such as growling, spitting, hissing, swatting, etc.—separate them again and follow the gradual reintroduction instructions below. Some cat parents have had success with rubbing a bit of tuna juice on their cats’ bodies and heads. The cats become so occupied with grooming, which is a relaxing behavior, that they’re less likely to be bothered by the other cat. If things go really well, the cats may actually groom each other because they can’t reach the juice on their own heads. Separate your cats as described above but for a longer period of time, and reintroduce them at a much slower pace, like several days to a few weeks. Instead of simply opening the door to reintroduce the cats, provide daily reintroduction sessions that very gradually move the cats closer and closer together under supervision. During the sessions, you might find it easier to control your cats with harnesses and leashes, or by confining one or both of your cats in crates. During the sessions, keep both cats distracted with food or play. Start out with them far apart. Keep the sessions short. Make it easy for them to succeed. Separate your cats between reintroduction sessions to prevent a relapse. Only when your cats can peacefully eat and play within a couple feet of each other should they be left alone together unsupervised. Trust them only for short periods together at first and increase their times together gradually. Behavioral medication may be helpful in reducing a domineering cat’s aggression and a skittish cat’s fear, making the reintroduction go more smoothly and quickly. Don’t hesitate to contact a Certified Applied Animal Behaviorist (CAAB or ACAAB) or a board-certified veterinary behaviorist (Dip ACVB) for guidance. One of these qualified experts can evaluate the problem and help you manage or resolve the conflict between your cats. Some cats simply cannot live together peacefully. Since chronic stress and tension isn’t healthy for people or pets, rather than force them to suffer years of stressful coexistence, it may be more humane to keep them permanently separated in the house or find another home for one of them. ~If you have two agressive cats, you might benefit from a product called Feliway. It can be had in a diffuser, that creates a calming environment to reduce tension and conflict in multi-cat homes. Find out if Feliway is right for your cats – ask us at FCVC. Feliway is available through the FCVC Online Pharmacy.